Ventriloquist Steve Petra's It's Alive is like a wild science class where the kids participate from the audience and up on stage. 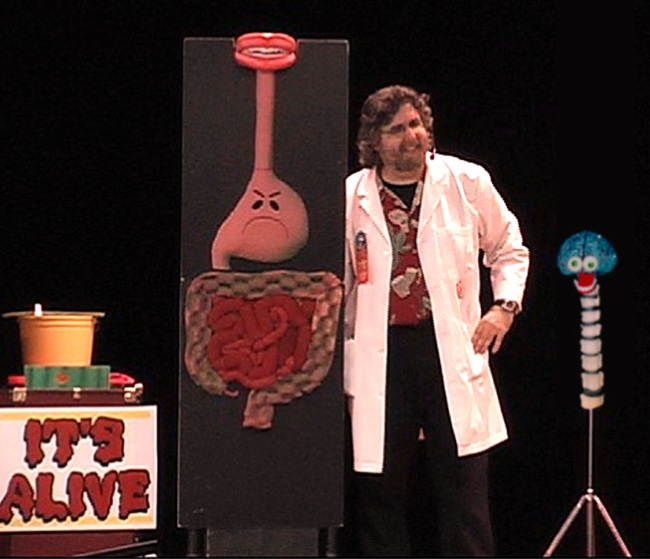 Student helpers come up to deliver messages from the brain to the parts of the body, scratch the nose, watch veins and arteries as the heart pumps the blood through them, stretch twenty feet of intestine across the stage and much more. The show features audience participation, illusions, original songs and music. Older version can include a substance abuse message about the damage alcohol and tobacco do to the organs of the body - only at the school's request. Perfect for STEM, Red Ribbon Week, Science Week, life skills, Health and Biology. Ask for the Teacher's Guide. BOCES assisted. Out of our area? Grab the rest of your district for a discounted block booking. City areas please note: we will only perform in schools with guaranteed off-street parking.